Objective : The two years Distance Learning Master of Science (M.Sc.) 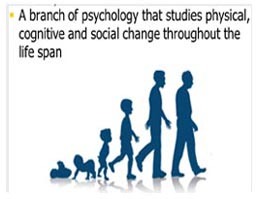 in Developmental Psychology conducted by The Global Open University, Nagaland has been designed for meeting the demand of the growing needs of experts in the fields of developmental psychology, positive psychology, personality development, neuropsychological assessment, mental disorder etc. Award : Master of Science (M.Sc.) with specialisation in Developmental Psychology shall be awarded to all the successful candidates by The Global Open University, Nagaland.